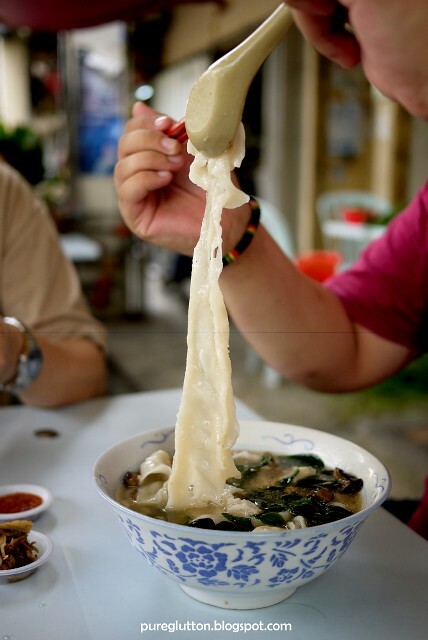 “I’m going to bring you to eat the Best Ever Pan Mee in town!” – that was what LL told me one fine morning. It is not very often that LL would actually bring me anywhere for food (it’s usually the other way round) and I wasn’t too sure that his promise of the “Best Ever Pan Mee” would hold true. You see, when it comes to Pan Mee, I’m very picky. Just like Fish-head Noodles, I will only go for the tested and proven places. Simply put: if I walk into any coffee-shop, I won’t order the Pan Mee or the Fish-head Noodles, unless they are highly highly recommended. So… OK, coming back to LL’s declaration, we decided to take him up on his offer … and that was how we found ourselves heading to Taman Sri Sentosa, just off Old Klang Road. It’s certainly not a familiar neighbourhood for us and LL, having just been there once (his friends brought him there) took us on a very roundabout and convoluted way to reach the place. The shop is located in a row of shophouses facing a small wet market, with tables laid out under huge umbrellas. When it comes to Pan Mee, I always go for the “traditional” version – ie, “pinched pieces” of the flattened dough instead of the rolled-out strands. And it must be the soup version – the “dry” version is never my choice. Yes, they are really very long! Or probably the cook had to resort to some “kung fu” stances when pulling out these long strips?! I like how the texture of the Pan Mee is very smooth and slightly chewy at the same time. There is a certain level of “bounciness” to the texture – I suspect the secret lies in the fact that not only plain wheatflour is used here. There must be additions of other types of flour involved, because plain wheatflour will not give that kind of texture. 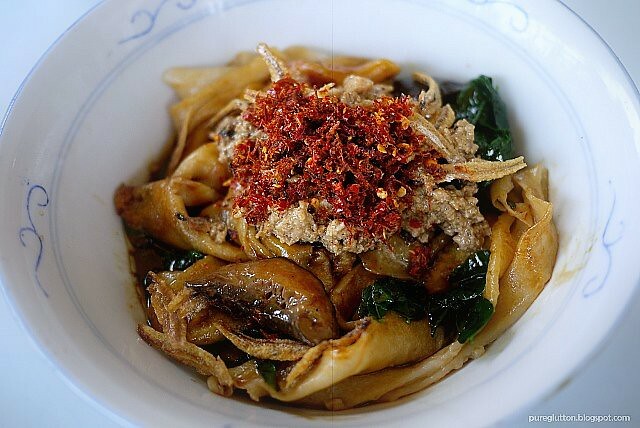 The Pan Mee came with the requisite condiments of minced pork, thick slices of mushroom, fried crispy anchovies and plenty of “sayur manis”. 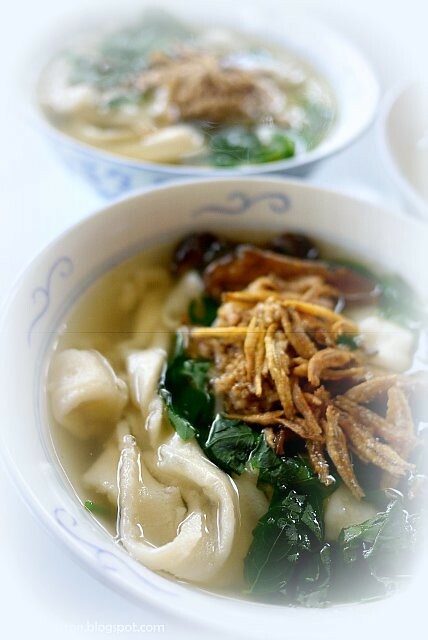 The soup base is very flavourful, the stock having been boiled with anchovies and pork bones and the “sayur manis” gave it some added sweetness. You can actually ask for extra portions of condiments, with an additional charge of RM1. The Pan Mee costs RM5.50 (small) and RM6.50 (big). There are other items on their menu, eg pandan chicken, pork balls… but I come here only for the Pan Mee. See, I’m very focused, that way. I’m so focused that I practically empty the whole bowl, soup and all. 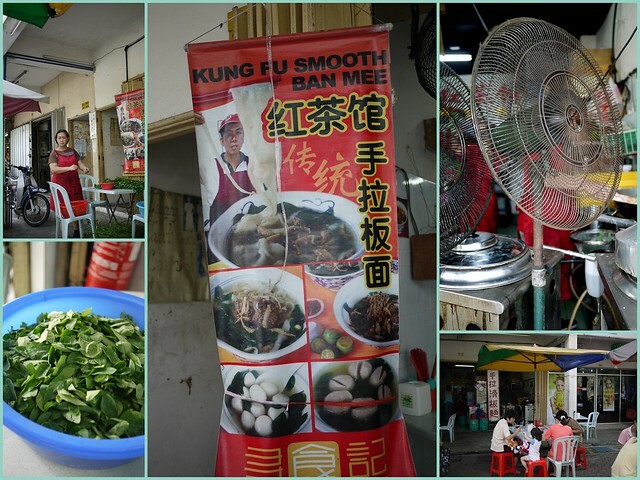 So, did this place live up to LL’s declaration of “Best Ever Pan Mee”? Yes, I believe it does! 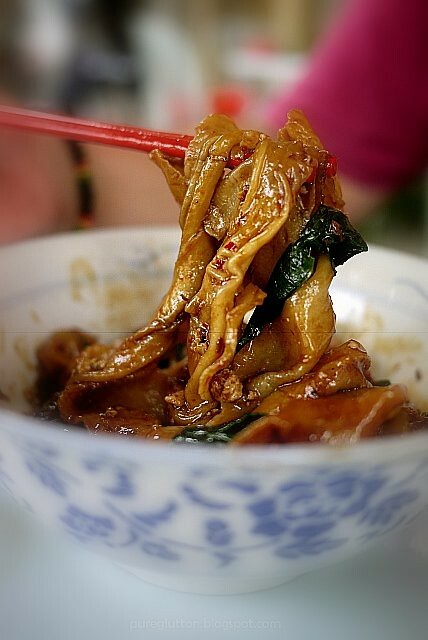 That’s because every time we have cravings for Pan Mee, guess where we’d be heading?! 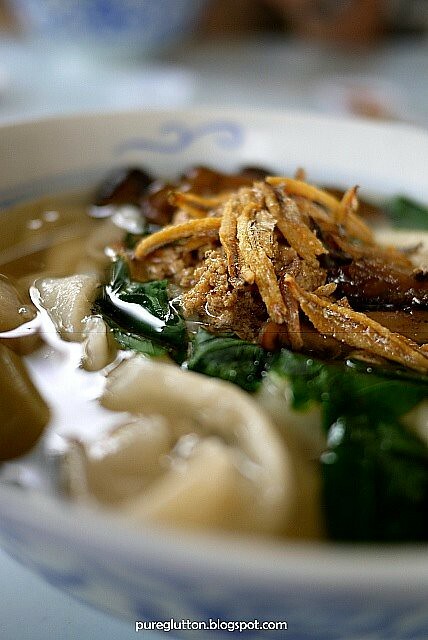 We really do get a massive KICK out of this Kung Fu Pan Mee, hehe! Open from 8am to 3pm. Closed on Mondays. To get here, drive to Old Klang Road from PJ Old Town. Take the second right hand turn at the traffic light to get into Taman Seri Sentosa. Follow the road i.e. Jalan Taman Sentosa and drive past apartments and high tension wires. You will then see a Petronas petrol station on your left which is on Jalan Taman Seri Sentosa 8, take the first right down Jalan Taman Seri Sentosa 8a and then immediate left at the shophouses (there’s a 7 Eleven at the corner). Drive down the road and take a right again at the end of the row where you will see Kedai Makanan BW Pasifik. Take an immediate right turn and drive down to the end of the road. The Pan Meen stall is on your left hand side facing the wet market. Ciki: Ya, it's really good! It's so good tht we wipe the bowl clean – soup & all! LFB: I'm surprised u haven't tried this, considering it's almost right at your doorstep! Go try la! Hahaha, kungfu stance when pulling the long strips, that makes sense! I'd completely forgotten about this place, and it's probably the last place anyone obsessed about pan mee should forget! The pandan chicken's good too but ridiculously overpriced! WOW I haven't had these for a while. And those hand made right? it look so yummy. Wishing you and your family a wonderful and prosperous year. Kung Hei Fatt Choy!